Raised in Santa Clarita, California, Dr. Sentlingar moved to Texas to attend Baylor University. While at Baylor, Dr. Sentlingar met her husband, Pat, a McKinney native, and began to adapt to the Texas way of life. Dr. Sentlingar earned her doctoral degree at Baylor College of Dentistry in downtown Dallas. 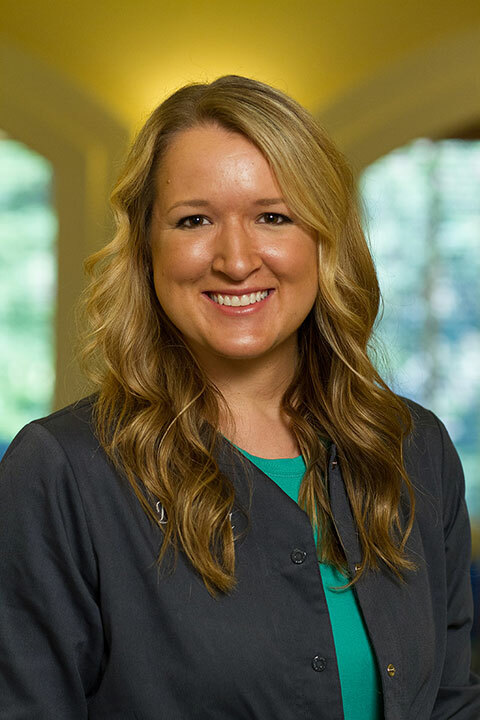 While attending Baylor, she developed a love for family dentistry because of the variety of challenges and rewards it brings. Dr. Sentlingar graduated first in her class, earning both the Gold Medal and Alpha Omega Scholar Awards. Dr. Sentlingar’s professional afflitations include the American Dental Association, The Academy of General Dentistry and the AES. Dr. Sentlingar was invited to be a member of the Piper-McKee Study Club in 2013 which focuses on advanced diagnosis and treatment of TMJ disorders and facial pain. She has studies with Dr. Piper and Dr. McKee for over 5 years and brings this knowledge into her every day practice. Dr. Sentlingar’s professional recognitions include: Gold Medal for First Scholastic Honors at Baylor College of Dentistry, Alpha Omega Scholastic Award, the Eleanor Bushee Senior Woman Dental Student Award, The Academy of Oral Medicine Award, The Texas Academy of General Dentistry Award, The Organization of Teachers of Oral Diagnosis Award, and selection into the Odontological Honors Society, Omicron Kappa Upsilon and Phi Beta Kappa. She is also certified by the World Clinical Laser Institute in the use of the Waterlase MD and the EZLase diode lasers. This year, Dr. Sentlingar is eligible to receive a Fellowship in the Academy of General Dentistry which requires 500+ hours of continuing education and passing the Fellowship Exam. Dr. Sentlingar completed these requirements in December of 2018 and she is waiting for the board’s approval of her requirements and application. We may have a big celebration this July! Dr Sentlingar has been invited to share her knowledge of TMJ disorders and iCAT (3D) imaging at multiple dental meetings. She loves sharing her knowledge and helping advance the field of dentistry. Dr. Sentlingar, most commonly known as Dr. Jill, is the proud mom of her two boys and wife of her Baylor Sweetheart, Pat. She and her family enjoy spending time outdoors and try to find as many opportunities as possible to go camping, where they love to fish and ride bikes. When they are at home, the Sentlingar family loves watching sports, especially the Baylor Bear and attend the boy’s sporting events. Dr Jill’s individual passions include bread making, Pilates, snuggling with her 3 Scottish Terriers and working her way to 100 rides on the Pelton this year. If you’re part of the Peloton family, you can follow her at toothdocpeddlin. The Sentlingar family has been a part of the Prosper community since 2004! 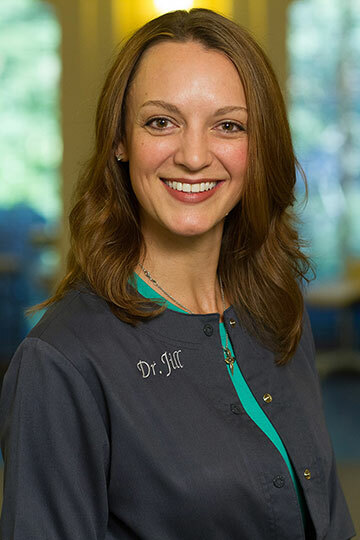 Dr Jill loves being a part of the overwhelming Prosper growth and is proud to have a family business in such a family-oriented community. Dr. Cara Kessler is a native Texan, born and raised in Bedford. She graduated from L.D. Bell High School and thereafter studied at Baylor University in Waco, Texas. She continued to further her education when she attended Baylor College of Dentistry in Dallas for her Master’s in Biomedical Sciences, focusing on TMJ research. Thereafter, she continued at Baylor College of Dentistry in Dallas for her Doctor of Dental Surgery degree. 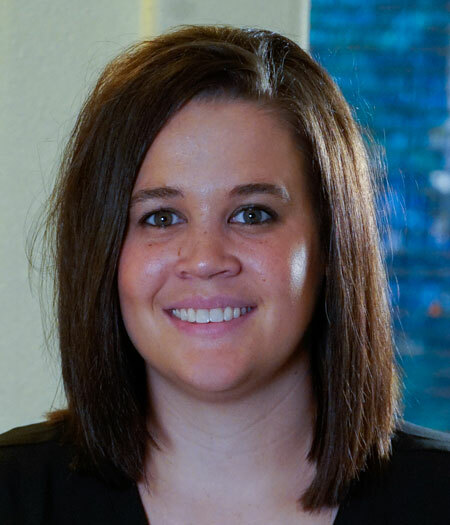 She was highly involved in research throughout her time in dental school, and even earned the prestigious Hinman Dental Society Student Research Award as well as an AADR Student Research Fellowship Travel Grant Award. She was also asked to participate in the AADR NSRG DENTSPLY/Caulk Competition. She was a member of the prestigious Odontological Honor Society and graduated with honors on the cumulative Dean’s List from Baylor College of Dentistry. Dr. Cara is a member with the American Dental Association, the Texas Dental Association, the North Texas Dental Society, and The Academy of General Dentistry. She is certified by the World Clinical Laser Institute in the use of the Waterlase MD and the EZLase diode lasers and certified to place Implant Direct implants. She enjoys staying up-to-date with current topics in dentistry by participating in multiple continuing education meetings throughout the country. She loves to educate patients on their oral health and treatment. Dr. Cara also enjoys donating her time to help patients in need, volunteering at Watermark Church’s Urgent Care clinic in Dallas once per month and volunteering for Texas Mission of Mercy events when they are held in North Texas. Dr. Cara spends most of her spare time with her husband and their two kids, Kynlee and Bennett. She enjoys spending time with friends and family, running, college football, traveling, and trying new restaurants. Staci is outgoing and caring. She strives to provide gentle, patient specific treatment that our patients genuinely appreciate. 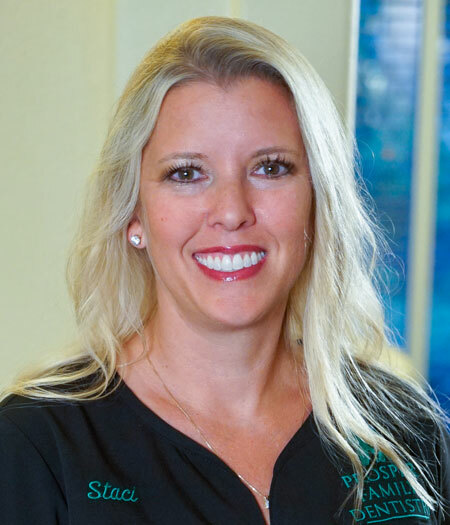 Staci received her Bachelor of Science Degree in Dental Hygiene from Baylor College of Dentistry in 1998. 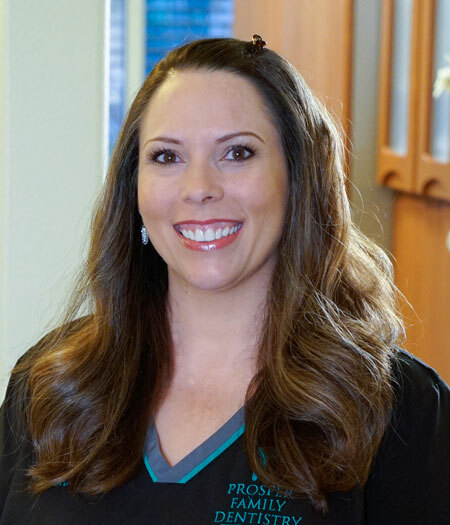 She is certified in nitrous oxide monitoring, CPR and sealant application, as well as EZLase laser whitening and diode laser therapy for the treatment of periodontal pockets. 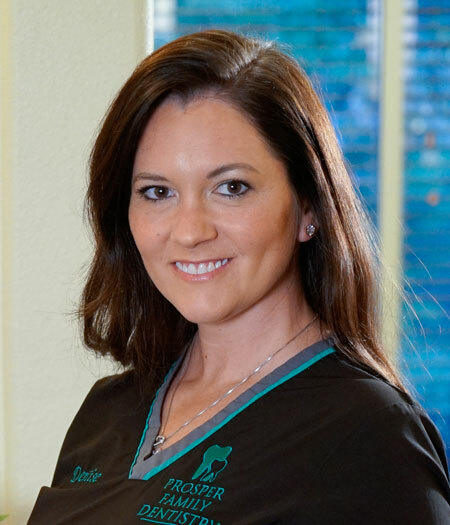 She initiated the Prosper Family Dentistry hygiene team in February 2005. Along with her husband and three boys, she loves going to church, sporting activities and vacationing. Kenneth was born and raised in a small town at the gulf coast of Biloxi, Mississippi. 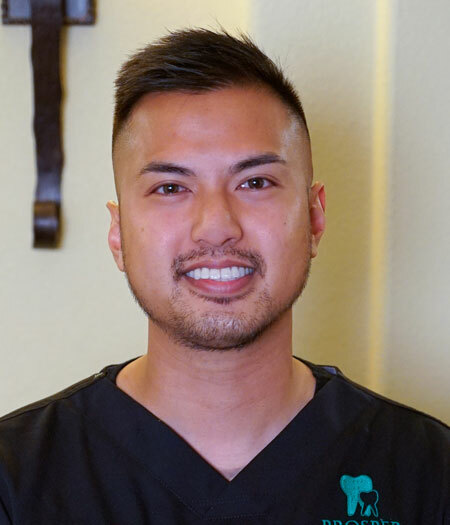 He earned his Dental Hygiene degree from Milwaukee Area Technical College in Milwaukee, Wisconsin, in 2011, and joined Prosper Family Dentistry in July of 2012. His goal is to educate patients about oral hygiene in order to prevent further dental problems. He shows great southern hospitality to his staff and patients and brings positive energy to his surroundings. In his free time, Ken enjoys spending time with his better half Noelle. Ken and Noelle love to travel, experiencing new foods and cultures. Together they are proud dog-parents to their beloved French bulldog Lily. Carli was born in Raleigh, North Carolina. She grew up in several locations around the U.S., but has lived in Texas the longest. She considers herself a local but not a native. 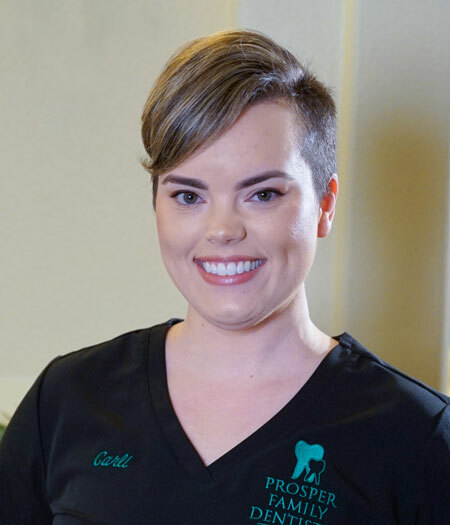 Carli joined the PFD family after graduating with her degree in Dental Hygiene in 2015. At work, Carli loves to empower patients with knowledge of how to best care for their oral health. She strives to make each patient in her chair feel at ease and free to ask questions. In her free time, Carli loves spending time with her husband and high school sweetheart, Jason. They have one daughter Ashlynn, and two dogs Daisy and Scooby. Denise has been with our office since March 2007. She is a registered dental assistant who is certified in nitrous oxide monitoring and CPR. She is hard working, outgoing and dependable and always makes it a point to keep the staff involved in fun activities. When she is not working she is having fun spending time with her children, Jacob, Taylor, and Baby Joseph. Kadi Jo was born and raised in Whitesboro, Texas. She is one of our many talented patient coordinators and clinical assistants. Her cheerful voice may be one of the first you hear when calling our office to schedule an appointment or pass information to the clinical staff. As a registered Dental Assistant, she is certified in nitrous oxide monitoring, x-rays, CPR, and coronal polishing. Kadi is organized and likes to keep moving! When she is not at the front desk, she may be found whirling around in the clinic assisting and organizing to her heart’s desire. 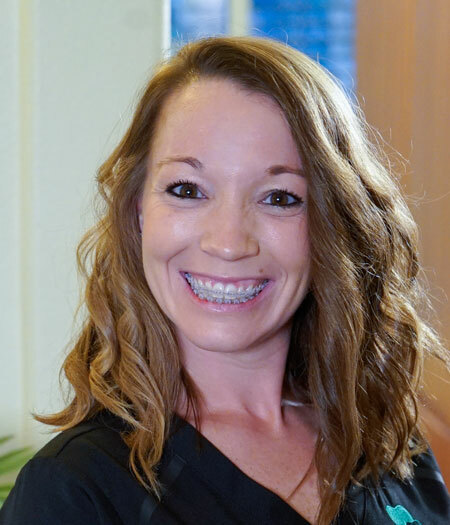 Kadi Jo has been in dentistry since 2013 with a background in orthodontics and pediatric dentistry, she has a real heart for working with children. At home, Kadi Jo loves to be outdoors spending time with her two energetic daughters Pazley and Tatum, and her boyfriend Cody. Kadi loves to hunt, fish, hike, and adventure in ATV excursions. Hannah joined our practice in the spring of 2014 as an intern to complete the qualifications of her Registered Dental Assistant certificate. She trained with us for 2 months and planned on looking for a job in a pediatric dental practice. After 2 months of working together, we decided not to let her leave us and hired her as a full time Dental Assistant. She is certified in nitrous oxide monitoring, x-rays, and CPR. Hannah is from Bells, Texas, and lives in Whitesboro with her husband Roy, and her two adorable boys Benjamin and Isaac. In her free time, she enjoys taking care of her boys, and spending time with her extended family, and being involved in her church. 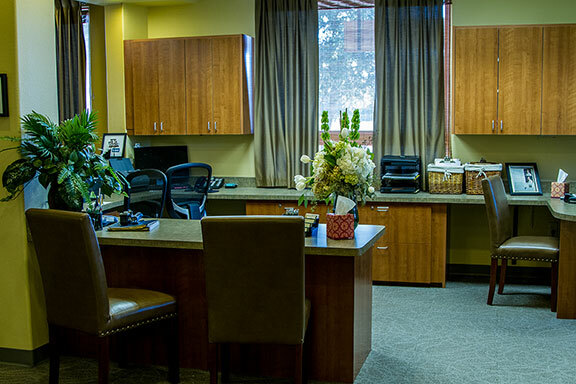 Lorrie is one of the first people you meet upon your arrival at Prosper Family Dentistry. Her cheerfulness is contagious, and she will put a smile on your face before you even sit down. When Lorrie joined the practice in April of 2009, she brought with her over 25 years of experience in the dental field. She is a registered dental assistant and CPR certified. Lorrie and her husband David have four children, 3 grandsons and 5 granddaughters. She enjoys spending time with her family and helping others. Melanie joined Prosper Family Dentistry in July 2011 and is happy to work with Dr. Jill and her wonderful team. 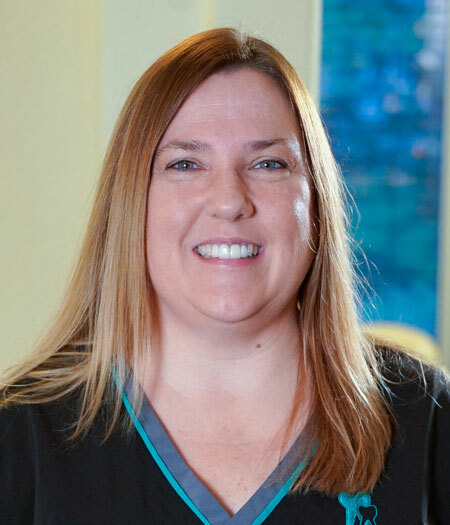 “It’s exciting to work with a team who are really dedicated to their patients and determined to give the best care possible.” Melanie is from Ardmore Oklahoma and started in dentistry in 1999 and looks forward to using her skills and experience to make sure every patient has a positive dental experience each time they visit our office. Melanie has been married to her husband Chris since 2006 and they have one son, Ethan. Melanie enjoys reading, traveling, cheering for OU her alma mater, and spending time with her family. What's our number one goal? To keep you out of the dental chair. We believe that every person has dental risks, and it is our job determine those risks and catch any problems before they start! To make that possible, we provide 3D imaging and comprehensive evaluations for both children and adults. 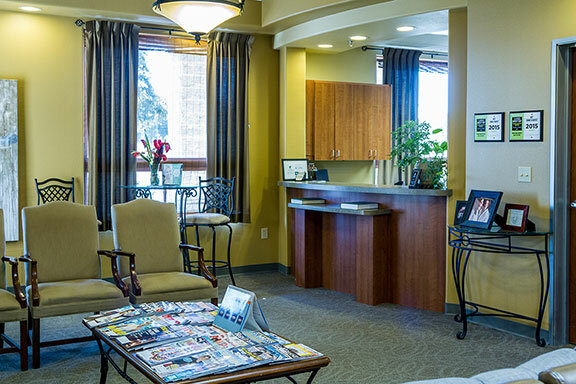 We don't just look at your teeth; we look at your comprehensive oral health and wellness. In children, we look at their growth and development, in addition to their dental health, so we can evaluate every risk that could lead to a potential problem. You won't find another team around that is as thorough, detailed or focused on your lasting oral health and wellness. Not only will we give you the most thorough evaluation and plan for your dental care, but we'll always do it in a way that allows you to feel loved, confident and comfortable with your care. 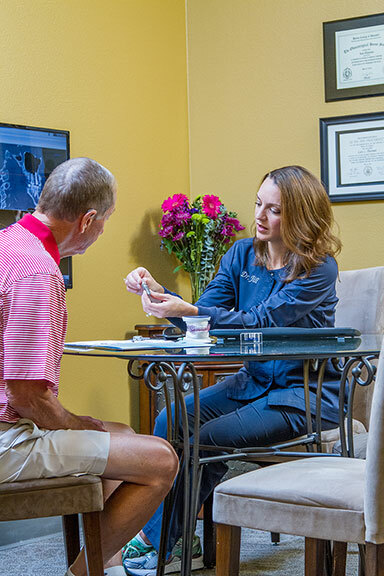 We will engage you in the decision-making process so you can understand the risks and benefits of all your treatment options. We will provide clear explanations and answer any questions you might have. You will be fully educated and deeply involved every step of the way. We are different from a "drill and fill" type of dental practice. 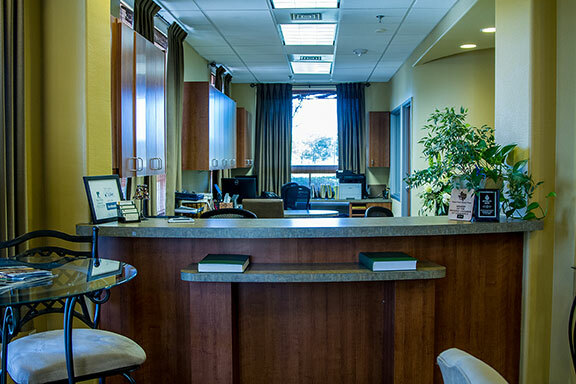 We are a relationship-based practice that does exceptional dentistry. 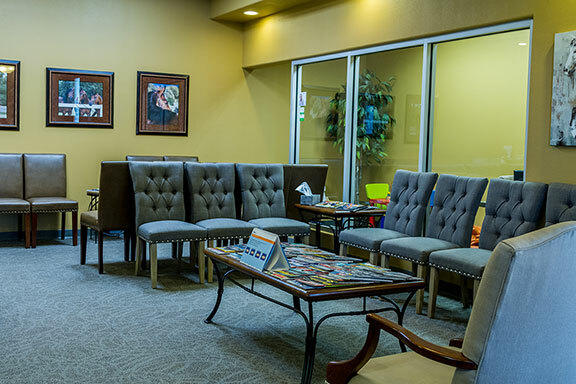 We know our patients by name and greet them personally when they walk through our doors. It's not uncommon to find any one of our team members sitting in the lobby visiting with a patient or family member before or after an appointment. We care about our patients on a personal level and always keep each patient's best interest at heart. Not only is our team passionate about providing exceptional patient care, we are passionate about delivering high-quality work. We never settle for anything but our very best in every treatment and service we provide. Our team is compassionate, competent, knowledgeable and professional. We have invested hundreds of hours in continuing education courses and are always looking for a better way to accomplish each task. You will be in expert hands with our team. We understand that it can be difficult for some to come to the dentist. Because of this, we go out of our way to make your experience feel like you're simply received dental care at home! The ambiance we've created here, between our decor, lighting, aroma and music, is truly home-like. Plus, we've got a genuinely compassionate team that knows you by name and is focused on you. These are just a few of the many ways we make your experience one to look forward to. 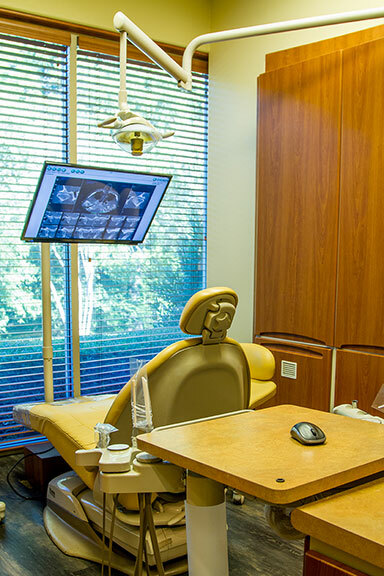 At Prosper Family Dentistry, we use some of the most state-of-the-art technology because it helps with more accurate diagnosis, gentler care and faster recovery for you. Our technologies include a 3D iCAT cone beam scanner, Trios digital impressions, CariVu radiation free cavity detection, Waterlase laser dentistry, Camlog and Implant Direct implant placement, digital imaging and intraoral cameras, to name a few. We will continue to invest with your needs in mind.